‘In the earlier half of the 21st century, masses of humanity were buried by gluttony and a consumer foodie fetish’ or at least, that’s what cultural historians will remark about our current food crazed era. From organic barberries to Beluga caviar, eating fashionable foods and glamorous dishes comes with an eye-popping price tag–but can we afford it? If you’re anything like Ab Fab’s hilarious duo Patsy and Eddy, perhaps you can. Or, if like me you live in the real world, then medical strikes, overpopulation and harmful carbon emissions in our environment suggest not. Back in 2008 it was reported by the Cabinet Office that: ‘The world’s population is predicted to hit 9Bn by 2050, up from today’s total of nearly 6.8Bn, and with it food demand is predicted to increase substantially,’ and it has. 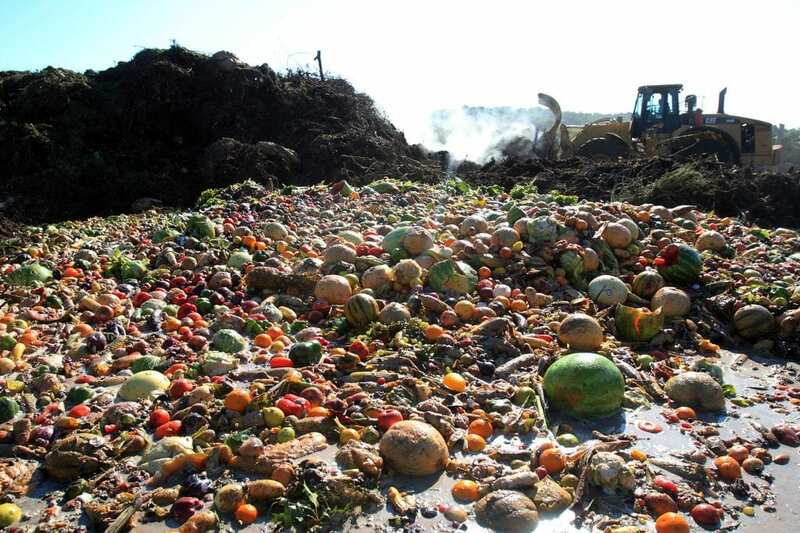 Since then the UK’s insatiable, experimental, foodie nation has gone on to top the European food waste chart of 2015; with the House of Lords finding in 2014 ‘an estimated 89m tonnes of food are wasted every year in the EU.’ That means at least 178 million tonnes of acrid, squandered food wastage is sitting in Europe’s already heaving, smelly mountainous heap of landfill right now mostly thanks to us; and that’s just over the course of two years, never mind the rest of the world. Equally, comical headlines such as how ‘The United States Officially Has Way Too Much Cheese Right Now’ may make you think food wastage barely passes as an urgent food issue. And the truth is, you’d be wrong. Especially if you were living in America (it’s a hefty multibillion problem for our Big Mac neighbours), but look a little closer to home and you’ll find Europe’s current food wastage situation is desperate. In 2011 36-year-old homeless male, Roman Ostriakov, was reported shoplifting. He had been spotted stealing cheese and frankfurter sausages after paying for breadsticks in an Italian store. Last year, it was reported his actions were not criminal. The Italian court ruled, ‘in the face of the immediate and essential need for nourishment’ his actions were not a crime due to present living circumstances. In Europe, we have more starvation and poverty on the streets than we care to admit. In fact, as many as ‘1.6 billion people lacked adequate housing’ worldwide, a 2005 United Nations study found. That’s over a sixth of humanity and counting. Take this with the news that the ‘Lifespan gap (is) ‘widening between rich and poor’ and you’re all set to feel sour about food waste. If lifestyle choices such as food quality and intake are the difference between life longevity and an earlier coronary than expected, it’s time to rethink the way we look at food. No person deserves to live a little less, simply because they didn’t have the opportunity to access a better quality of edibles. Whilst foodie shows such as Man v Food (no offence, we appreciate you Adam Richmond) may celebrate quantities of food and availability over taste, many are in dire need of our commercial throw-aways. Marry all of this with the current NHS crisis and a foredoomed generation of tired, underpaid, overworked doctors and you’ve got a catch 22. This is how it’s looking: if food waste isn’t reduced soon and the British population expands further with an inadequate healthcare system (and no support from the EU, potentially) we really are in a pickle. Instead of bright, the future is malnourished. Despite Sylvia Lovegren’s witticism in the nineties that, ‘Cuisina Povera–the cuisine of poverty–in the form of beans, was a big fad at the beginning of the decade. We were all feeling poor, whether we were or not, but to eat poor stylishly seemed critical to our well-being’ in Fashionable Food: Seven Decades of Food Fads eleven years ago, it seems the irony has come back to bite Britain. If Donald Trump as the President of the United States for the next few years doesn’t scare you, the amount of food wastage Britain is harbouring should. 2017 is the year to make a significant change in levels of food waste, or we truly will evolve into a nation of hungry, broke consumers.